A common problem for companies in the access industry is how to dispose of aging equipment. Selling used equipment into the local market can ultimately create a direct competitor, trading at discounted rate s with a fleet of old but well-serviced machines. One company providing a very viable solution across Australia is Action Equipment. 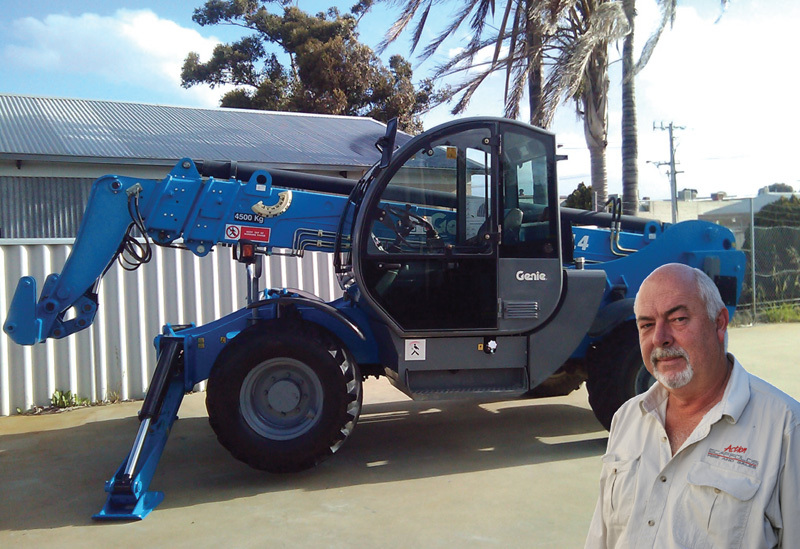 Headed by industry stalwart and ex-Genie manager, Malcolm Pfrunder, Brisbane based Action Equipment is purchasing Genie® equipment and placing it in offshore markets. While reluctant to specify the exact nature of markets where used Genie machinery is destined, Malcolm confirms that he has customers in both developed and emerging countries. Action Equipment is also working with Genie branches in select locations. Once used Genie equipment is purchased, it is checked to be fully operational. Small amounts of cosmetic detailing work may be undertaken where warranted. Then, after thorough cleaning, the unit is exported. Typically, Action Equipment purchases surplus access equipment, units that are from seven to eight years old through to equipment past its time for a 10 year inspection. Typical of a transaction is a Genie® GTH™-4514 telehandler. This unit was purchased by Action Equipment and it was put through the process which included a thorough mechanical appraisal, respray and a set of new decals. It has now found its way to Myanmar (Burma) to become the first Genie telehandler in the country. In addition to the purchase and export of used Genie equipment, Action Equipment’s Perth branch is also working closely with some of the bigger hire and rental companies to provide a refurbishment service. In the event that a machine returns from hire and needs more than a pressure clean, Action Equipment has the skill and facilities to paint and refurbish back to an acceptable state with the costs often being chargeable as customer damage. This is a growing aspect of Action Equipment’s business and is saving their hire company clients the costs associated with running their own paint and repair shop.